How do you know if baby is having a problem if she can’t speak? Can moms and dads be trained to see the stress their baby is feeling? Can babies have posture problems in the same way that adults can have posture problems? We look at the common but rarely recognized posture problems in babies that show up in the first days to months of life. Posture problems in babies that aren’t so obvious? Signs of major spine and joint injuries from birth are pretty well known. Some of the most common would be a shoulder injury (dystocia), or a cone head (suture overlap) from a rough birth. This baby has responded to a gentle chiropractic adjustment of the skull to the neck. But what about the kinds of mild injuries that don’t cause any obvious problems? What about subtle shifts in the spinal column under the infant’s heavy head? Are they there? Do they exist? What kind of signs might we see in babies who have mild neck injury, besides an obvious wry neck (torticollis) or obviously misshapen skull (plagiocephaly)? Infants can’t tell us they’re in pain or where there might be a problem. So we have to rely on clues in their behavior, their movement, their positioning, and other subtle symptoms. What kind of symptoms? The overwhelming experience of chiropractors and manual therapists who work with an infant population will see digestive problems, colicky behavior, sleep disturbances, and problems eating/suckling. While there are health care providers who reject the idea that infants can experience subtle postural misalignments that lead to these kinds of problems, the sheer number of providers who unanimously report resolution of these symptoms with spinal adjustments is evidence that this phenomenon is real. What kind of movement and positioning problems? For example, one study of 90 infants in Norway* showed 56 had notable problems in their posture that indicated an issue. But what other signs can parents look for in their infants? A German doctor and manual therapist has provided a really great visual in the text “Manual Therapy in Children.” In a syndrome he has named Kinematic Instability due to Sub-Occipital Strain (KISS), two different kinds of problem posture patterns are presented. One pattern shows that the infant, when placed on her back, tends to show lateral flexion of the body and the head to a predominant side (hiking up the hip, shortening the leg, rotating or lowering the shoulder, and tipping the head to one side). The other pattern shows the child moving into a resting posture of hyper-extension, where the back arches, the chin goes up, and the arms are raised over the head. It’s important to note that the infants are not “stuck” in this position. They can continue to move, and there may not be an obvious restriction in any of their movements. However, they return to these resting positions over and over again. Can you see the posture shift in this baby? 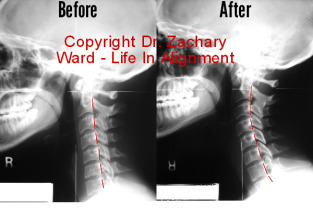 In the pictures to this post there are a couple of babies that had this locked/irritated posture pattern before being gently released in our upper cervical/structural chiropractic practice. One had symptoms (in this case some difficulties sleeping) and the other infant didn’t have an identifiable symptom other than the issue of the posture itself. Looking closely, can you see the asymmetry in the position of the head? The pelvis? The shoulder? Picked up and set back down, these babies would keep returning to this position. Once they were released, this pattern would not return unless the spine shifted back under a new stress. Have you seen this posture in any of the babies you know? Once parents are exposed to the appearance of these problems posture patterns, they find it easy to spot them in their children, or in the babies of friends or other family members. In addition to a resting posture problem, there are other assessments that parents can learn from a chiropractor. For example, in my practice the spinal muscle tone, tone of the gluteus muscle, mobility of the sacro-illiac joint, baby head shape, and the ability to rotate the head are all assessed to determine if there is a subtle problem in alignment. Once identified and guided by the chiropractor, most parents can even replicate these evaluations and begin to monitor their baby’s alignment in a basic way, to track the baby’s response to the chiropractors adjustment. If you’re in the Detroit Metro area and are interested in learning if your baby is showing any of these signs, you’re welcome to set up an infant consultation with us via our contact form, or by calling 248-598-4002.